Symmetry provides outstanding human resource advice, support, and advocacy to start-up and small companies who do not have an in-house human resource team. Free weekly business tips for managing employees, time saving tips and more. Subscribe today! How to Terminate Employees: HR tips and best practices for firing employees. 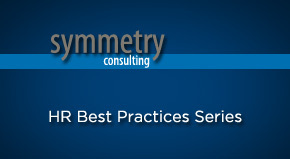 Symmetry Consulting's human resource experts provide businesses with quality human resource and employment law advice. Our step-by-step recommendations align with current legislation and best HR practices.